‘Tis the season for families to gather around the dining room table in celebration, friends to meet to finish last-minute shopping, and parties to be thrown to usher in the new year. For many of us, our calendars are jam-packed with plans. But for seniors living on their own, they can feel lonely and the holidays can be particularly difficult. Deck the halls. 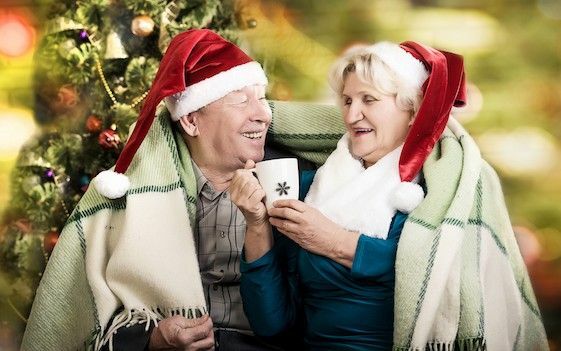 Whether they are living independently or are in an assisted living community, make their home or apartment feel festive and joyful. Fresh pine boughs, wreaths, and fresh flowers are a wonderful way to bring in the scent of the season. Holiday card writing. Sending and receiving holiday cards helps them stay connected to lifelong friends and family. Play some holiday tunes, pour a cup of hot chocolate, and pull up a comfortable chair to write holiday cards together. Lend them an ear. They may want to share their feelings of loneliness and sadness. Just by listening, you can make a difference. Join their festivities. If your loved one lives in an assisted living community, most communities plan events for the whole family during the holidays, so add these to your family calendar and join in the fun. Religion and worship. Attend religious services together as a family. Your loved one may find great comfort in their faith during the season. Turkey and all the trimmings. Most families look forward to the traditional baked goods and dishes made year after year to celebrate the holidays. Involve your loved ones in the baking and cooking in the kitchen. Perhaps, package small samples of your baked treats and share these treats with their friends and neighbors. The perfect gift. If they can no longer drive or have mobility issues, offer to drive them to an event, shopping for gifts, or to the grocery store for extra baking supplies. A warm car and help carrying in heavy groceries might just be the perfect gift! Bring the celebration to them. If your loved one can’t make it to a celebration or party, then make an extra effort to bring the party to them with visits from family and grandchildren. If you loved one can no longer live independently, or if their isolation is detrimental to their health, you may want to consider moving your loved one into an assisted living community. At Aegis Living, your family member will be surrounded by neighbors, new found friendships, and around-the-clock caregivers. The comradery and friendships within our communities are a source of joy, a boost of confidence, and proven to improve one’s sense of wellbeing. Each day, residents enjoy a full schedule of enriching activities that appeal to their interests and passions. Schedule a tour of any of our assisted living or memory care communities today to see for yourself how living in a community can give your loved one a sense of connection. At Aegis Living, we wish you a warm and wonderful holiday for you and your family!